No external drive needed. This portable USB2.0 drive supported plug and play, which is powered by your computer's USB port. 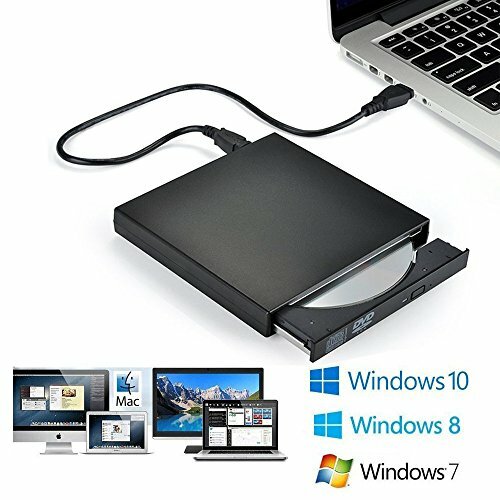 With portable and compact design, it is convenient for you to view DVD movies, listen to CD music, watch photos or images and copy music, video, or data to a CD(only CD). ❀ HIGH SPEED - It is compatible with USB2.0 and backwards compatible with USB1.0.This CD-RW combo drive supported DVD+R, DVD-R, CD-ROM, DVD-ROM, CD-R, CD-RW. Max DVD read speed 8X; Max CD read speed 24X and max CD burn speed 8X. ❀ UNIVERSAL COMPATIBILITY - Windows 2000/XP/Vista/Windows7. (NOTE: Not including Windows 98/SE). ❀ WELL DESIGN - It is portable for traveling with your laptop thanks to its small size. It will be specially handy for your work if you want to give presentations to the business. Just burn the CD to suffice everything and do not need to carry laptops everywhere. ❀ 2 CABLES - Come with 2 cables, one is data cable and the other is power cable that can supply power to get rid of the trouble of shortage power. When connect it to the desktop, please connect both cables or connect it with the computer's mortherboard. If you have any questions about this product by Blingco, contact us by completing and submitting the form below. If you are looking for a specif part number, please include it with your message.